For the C. S. Lewis novel, see The Silver Chair. For other uses, see Silver Chair (disambiguation). Silverchair on stage in August 2006. Silverchair's alternative rock sound had evolved throughout their career, differing styles on specific albums steadily growing more ambitious over the years, from grunge on their debut to more recent work displaying orchestral and art rock influences. The songwriting and singing of Johns had evolved steadily while the band had developed an increased element of complexity. In 2003, following the release of Diorama, the band announced a hiatus, during which time members recorded with side projects The Dissociatives, The Mess Hall, and Tambalane. Silverchair were reunited at the 2005 Wave Aid concerts. In 2007, they released their fifth album, Young Modern, and played the Across the Great Divide tour with contemporaries Powderfinger. In May 2011, Silverchair announced an indefinite hiatus. As of January 2019, Silverchair have sold over 10 million albums worldwide. Silverchair's founders, Ben Gillies and Daniel Johns, attended the same primary school in the Newcastle suburb of Merewether. As teenagers, singer-guitarist Johns and drummer Gillies, started playing music together – in one class they built a stage out of desks and played rap songs for their schoolmates. When they moved on to Newcastle High School, a fellow student, Chris Joannou, joined the pair on bass guitar. In 1992, they formed Innocent Criminals with Tobin Finane as a second guitarist – but he soon left. They played numerous shows around the Hunter Region in their early teens, their repertoire was cover versions of Led Zeppelin, Deep Purple and Black Sabbath. In 1994 Innocent Criminals entered YouthRock, a national competition for school-based bands and placed first ahead of older competition. Early in the year they recorded demos of "Acid Rain", "Cicada", "Pure Massacre" and "Tomorrow" at Platinum Sound Studios. In April, the band's mainstream breakthrough came when they won a national competition called Pick Me, using their demo of "Tomorrow". The competition was conducted by the SBS TV show Nomad and Australian Broadcasting Corporation (ABC) alternative radio station Triple J. As part of the prize, Triple J recorded the song and ABC filmed a video, which was aired on 16 June. For the video's broadcast, they had changed their name to Silverchair (styled as silverchair until 2002). In a 1994 interview with Melbourne magazine Buzz, the band claimed the name derived from a radio request for "Sliver" by Nirvana and "Berlin Chair" by You Am I being mixed up as Silver Chair. It was later revealed they were named for the C. S. Lewis-penned novel The Silver Chair from The Chronicles of Narnia series. Following a bidding war between rival labels, Silverchair signed a three-album recording contract with Sony Music subsidiary Murmur Records. Initially the group were managed by their parents. Sony A&R manager John Watson, who was jointly responsible for signing the group, subsequently left the label to become their band manager. In September, their Triple J recording of "Tomorrow" was released as a four-track extended play. From late October, it spent six weeks at number-one on the ARIA Singles Chart. In 1995, a re-recorded version of "Tomorrow" (and a new video) was made for the United States market, becoming the most played song on US modern rock radio that year. Silverchair's debut album, Frogstomp, was recorded in nine days with production by Kevin Shirley (Lime Spiders, Peter Wells) and was released in March 1995. At the time of recording, the band members were 15 years old, and still attending high school. Frogstomp's lyrical concepts were fiction-based, drawing inspiration from television, hometown tragedies, and perceptions of the pain of friends. The album was well received: Allmusic and Rolling Stone rated it in four and four-and-a-half stars respectively, praising the intensity of the album, especially "Tomorrow". Aside from Innocent Criminals, the band has used The George Costanza Trio and Short Elvis as aliases. Frogstomp was a number-one album in Australia and New Zealand. It reached the Billboard 200 Top 10, making Silverchair the first Australian band to do so since INXS. It was certified as a US double-platinum album by the RIAA, triple-platinum in Canada by the CRIA and multi-platinum in Australia. The album sold more than 4 million copies worldwide.Paste magazine called this album the "last stand" of grunge. As Frogstomp and "Tomorrow" continued to gain popularity through 1995, the group toured the US where they supported Red Hot Chili Peppers in June, The Ramones in September, and played on the roof of Radio City Music Hall at the MTV Music Awards – in between touring they continued their secondary education in Newcastle. At the ARIA Music Awards of 1995, the band won five awards out of nine nominations. To collect their awards on the night they sent Josh Shirley, the young son of the album's producer. In a January 1996 murder case, the defendant counsel for Brian Bassett, 16, and Nicholaus McDonald, 18, of McCleary, Washington, claimed that the pair listened to "Israel's Son", from Frogstomp, which contributed to the murder of Bassett's parents and a younger brother. McDonald's lawyer cited the lyrics "'Hate is what I feel for you/I want you to know that I want you dead'" which were "almost a script. They're relevant to everything that happened". The band's manager, Watson, issued a statement that they did not condone nor intend any such acts of violence. Prosecutors rejected the defence case and convinced the jury that the murder was committed to "steal money and belongings and run off to California." Silverchair began recording their second studio album, Freak Show, in May 1996 while experiencing the success of Frogstomp in Australia and the US. It was produced by Nick Launay (Birthday Party, Models, Midnight Oil) and was released in February 1997. The album reached number-one in Australia and yielded three Top 10 singles – "Freak", "Abuse Me", and "Cemetery". Its fourth single, "The Door", reached No. 25. The songs focused on the anger and backlash that the expectations of Frogstomp brought upon the band. Freak Show was certified gold in the US, 2× platinum in Australia and global sales eventually exceeded 1.5 million copies. By late 1997, the trio had completed their secondary education and, from May 1998, they worked on their third album, Neon Ballroom which had Launay producing again. It was released in March 1999 and peaked at number-one in Australia. McFarlane said, "As well as being the band's best album to date, it was universally acknowledged as one of the best albums of the year." The band originally intended to take a 12-month-break, but in the end decided to devote their time to making music. Neon Ballroom provided three Australian top 20 singles: "Anthem for the Year 2000", "Ana's Song (Open Fire)" and "Miss You Love"; a fourth single, "Paint Pastel Princess", did not reach the top 50. The albums charted well internationally: Freak Show reached No. 2 in Canada, and Neon Ballroom reached No. 5. Both reached the top 40 on the United Kingdom Albums Chart. "Abuse Me" reached No. 4 on Billboard's Hot Modern Rock Tracks and Hot Mainstream Rock Tracks charts. "Ana's Song (Open Fire)" peaked at No. 12 on the Hot Modern Rock Tracks. In 1999, Johns announced that he had developed the eating disorder anorexia nervosa, due to anxiety. Johns noted that the lyrics to "Ana's Song (Open Fire)" dealt with his disorder, where he would "eat what he needed ... to stay awake." He revealed that his eating problems developed from the time of Freak Show and when Neon Ballroom was written he "hated music, really everything about it", but felt that he "couldn't stop doing it; I felt like a slave to it." Johns sought therapy and medication but felt "It's easier for me to express it through music and lyrics". Silverchair added an auxiliary keyboardist, Sam Holloway (ex-Cordrazine), for the Neon Ballroom Tour. The US leg had the group playing with The Offspring and Red Hot Chili Peppers, while Silverchair's tour of UK and European had The Living End as the support act. Rolling Stone's Neva Chonin attributed their chart success to the album's more "mature" sound. In Europe and South America it became the group's most successful album to date. The group appeared at festivals in Reading and Edgefest, amongst others. Following the tour, the band announced that they would be taking a 12-month-break. Their only live performance in 2000 was at the Falls Festival on New Year's Eve. On 21 January 2001, the band played to 250,000 people at Rock in Rio, a show they described as the highlight of their career. After the release of Neon Ballroom, Silverchair's three-album contract with Sony Music had ended. The group eventually signed with Atlantic Records for North and South America, and formed their own label with Watson, Eleven: A Music Company (distributed by EMI), for Australia and Asia. In November 2000, after the group had left the label, Sony issued The Best of Volume 1 without the band's involvement. Johns disavowed the compilation, "We thought about putting out ads in the street press to make people aware that we weren't endorsing it, but that would have blown the whole thing out of proportion ... If people want to buy it, they can buy it but I wouldn't buy it if I was a silverchair fan." In June 2001, Silverchair entered a studio in Sydney with producer David Bottrill (Tool, Peter Gabriel, King Crimson) to start work on their fourth album, Diorama. Johns formally assumed the role of a co-producer. The album name means "a world within a world". Most tracks came from Johns' new-found method of writing material on a piano, a technique he developed during the band's break after Neon Ballroom. In order to complete the vision for Diorama, several other musicians contributed to the album, including Van Dyke Parks, who provided orchestral arrangements to "Tuna in the Brine", "Luv Your Life", and "Across the Night". Paul Mac (from Itch-E and Scratch-E) and Jim Moginie (from Midnight Oil) both on piano also collaborated with the band. While recording Diorama, Johns referred to himself as an artist, rather than simply being in a "rock band". Upon its release, critics commented that the album was more artistic than previous works. Early in December, the first single, "The Greatest View", was released to Australian radio networks. Its physical release in January 2002 coincided with the band's appearance on the Big Day Out tour. Early in 2002, Johns was diagnosed with reactive arthritis which made it difficult for him to play the guitar and subsequent performances supporting the album's release were cancelled. In March, Diorama was issued and topped the ARIA Albums Chart – it became their fourth number-one album and spent 50 weeks in the top 50. Five singles were released from the album: "The Greatest View", "Without You", "Luv Your Life", "Across the Night", and "After All These Years" – "The Greatest View" charted highest, reaching No. 3. In October, Silverchair were successful at the ARIA Music Awards of 2002, winning five awards including 'Best Rock Album' and 'Best Group', and 'Producer of the Year' for Johns. The band played "The Greatest View" at the ceremony: the song was also nominated for 'Best Video'. Two singles (and a related video) were nominated for further ARIA Awards in 2003. Following the 2002 ARIA Awards, the band announced an indefinite hiatus. Johns said it was necessary "given the fact the band were together for over a decade and yet were only, on average, 23 years old". 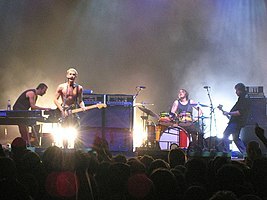 From March to June 2003, Silverchair undertook the Across the Night Tour to perform Diorama. Their hometown performance on 19 April was recorded as Live from Faraway Stables for a 2×CD and 2xDVD released in November. After the tour finished in June the group announced an indefinite hiatus. In 2000, while also working with Silverchair, Johns and Mac released an internet-only EP, I Can't Believe It's Not Rock. In mid-2003, during Silverchair's hiatus, the pair re-united and formed The Dissociatives, releasing a self-titled album in April 2004. The duo provided the theme music for the popular ABC-TV music quiz show Spicks and Specks – as a reworking of the Bee Gees' 1966 hit of the same name. Johns also collaborated with then-wife Natalie Imbruglia on her Counting Down the Days album, released in April 2005. Joannou worked with blues-rock group The Mess Hall; he co-produced – with Matt Lovell – their six-track extended play, Feeling Sideways, which was released in May 2003. The album was nominated for the ARIA Award for 'Best Independent Release' in 2003. Joannou and Lovell co-produced The Mess Hall's studio album, Notes from a Ceiling which was issued in June 2005. Joannou and Lovell received a nomination at the ARIA Music Awards of 2005 for 'Producer of the Year'. In 2003, Gillies formed Tambalane with Wes Carr, initially as a song-writing project, they released a self-titled album in 2005 and toured Australia. The 2004 Boxing Day tsunami resulted in the WaveAid fund-raising concert held in January 2005: Silverchair performed to help raise funds for aid organisations working in disaster affected areas. As a result of WaveAid the band decided to resume working together. Gillies explained the band's reunion as due to a special "chemistry" between band members, telling The Sydney Morning Herald, "It only took us 15 years, but recently we've realised, 'We've really got something special and we should just go for it.'" Silverchair performing on the Across the Great Divide Tour in September 2007. After performing at Wave Aid, Silverchair reunited and by late 2005 began preparations for their next studio album, Young Modern. Johns had written about 50 songs during the hiatus for a possible solo album or other project but decided to use them for Silverchair. In 2006, after five weeks practice the group demoed tracks in the Hunter Region, and then recorded at Los Angeles' Seedy Underbelly Studios with Launay as producer. Parks again arranged orchestral tracks for the band – they travelled to Prague to record with the Czech Philharmonic Orchestra. The group also used Mac, Luke Steele (The Sleepy Jackson) and Julian Hamilton (The Presets, The Dissociatives) – Hamilton also co-wrote songs with Johns. 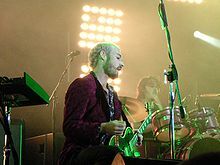 Silverchair self-funded the album's production to ease the pressures faced previously when working with a record label. The band toured extensively before releasing the album, performing at Homebake and numerous other shows. Both Mac and Hamilton joined the tour as auxiliary members providing keyboards. In October, they performed a cover of Midnight Oil's 1981 single, "Don't Wanna Be the One", at the ARIA Music Awards of 2006 as part of that band's induction into the ARIA Hall of Fame. During the performance Johns spray-painted "PG 4 PM" (Peter Garrett for Prime Minister) on a stage wall, paying tribute to that band's front-man, then a Federal Member of Parliament and Minister for the Environment, Heritage and the Arts. Young Modern was released in March 2007, as was the first single, "Straight Lines". Three more singles, "Reflections of a Sound", "If You Keep Losing Sleep", and "Mind Reader", were subsequently released. Young Modern became the fifth Silverchair album to top the ARIA Albums chart – they became the first artists to have five number-one albums. "Straight Lines" also became the band's third No. 1 single in Australia. In June, Silverchair and fellow rock group Powderfinger announced the Across the Great Divide Tour. The tour promoted the efforts of Reconciliation Australia in mending the 17-year gap in life expectancy between Indigenous and non-Indigenous children. Support acts on the tour were John Butler, Missy Higgins, Kev Carmody, Troy Cassar-Daley, Clare Bowditch and Deborah Conway. 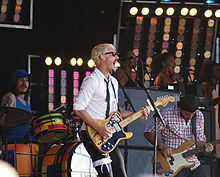 Young Modern and "Straight Lines" each won three awards at the ARIA Music Awards of 2007, taking Silverchair's total to 20. The group also won three APRA Awards for their song "Straight Lines", including Songwriter of the Year, which Johns was awarded for a record third time. At the ARIA Music Awards of 2008 both Silverchair and Powderfinger won 'Best Music DVD' for Across the Great Divide, for Silverchair this was their 21st win from 49 nominations. According to Silverchair's website, as of June 2009, the group had begun work on the follow-up to Young Modern, they had spent three weeks recording in Australia with future sessions earmarked for later that year. No release date was set, but the band uploaded in-studio videos of them working on several tracks to their official website. In December, Johns called in to Triple J's breakfast show, Robbie, Marieke and The Doctor, and discussed the band's new album which they were working on in Newcastle. He told them "the main difference is there's a lot of experimentation with instruments and synths... I think there's only guitar on four songs out of fifty so far," but added the new material is "surprisingly rocky given there's no guitar." In April 2010, via the band's website, Joannou announced that they would perform two new songs called "16" and "Machina Collecta" at May's Groovin the Moo festival. He said work was progressing well and confirmed there was, as yet, no title for the proposed album and that they were simply referring to it as Album No. 6. The final concert of the festival was at Bunbury on 15 May. By year's end, work on the album had stopped as each member pursued other interests. We formed Silverchair nearly 20 years ago when we were just 12 years old. Today we stand by the same rules now as we did back then ... if the band stops being fun and if it's no longer fulfilling creatively, then we need to stop. [...] Despite our best efforts over the last year or so, it's become increasingly clear that the spark simply isn't there between the three of us at the moment. Therefore after much soul searching we wanted to let you know that we're putting Silverchair into "indefinite hibernation" and we've decided to each do our own thing for the foreseeable future. —  Daniel, Ben and Chris, chairpage.com (Silverchair Official Website), 25 May 2011. Sydney Morning Herald's music writer, Bernard Zuel, said the band's use of "indefinite hibernation" was a way to soften the blow of the group's break-up for fans; he expected future reunions and performances for worthy causes. By June, Gillies was in the final stages of about 12 months of working on his solo album and he said that it was not a continuation of his earlier work with Tambalane. In October, Johns was working on the soundtrack for My Mind's Own Melody – a short film. In May 2012 Johns recorded the new anthem for Qantas titled 'Atlas.' It is the first piece of commercial music Johns has composed. The members of Silverchair have stated that they have not ruled out a reunion. Gillies has said that there are plans to release a new Silverchair album, which was almost finished before the hiatus. Silverchair are generally classified as an alternative rock and grunge band, although their loyalty to specific genres has changed as they have matured. Much of the band's early grunge and post-grunge work was inspired by Nirvana, Pearl Jam, Soundgarden, Alice in Chains and Black Sabbath. According to Australian rock music historian Ian McFarlane, "frogstomp captured the tempo of the times with its mix of Soundgarden/Pearl Jam/Bush post-grunge noise and teenage lyrical angst." In their early years the perceived stylistic similarities led to Silverchair being derisively dubbed as 'silverhighchair', 'not Soundgarden but Kindergarden' or 'Nirvana in Pyjamas' by the Australian media. The latter is a sarcastic conflated reference to the band's youth and the popular Australian children's TV series Bananas in Pyjamas. McFarlane stated "Freak Show and tracks like 'Freak' were firmly in Nirvana territory with a hint of Led Zeppelin's Eastern mysticism". Gillies noted that the band were inspired by the Seattle Sound, as well as The Beatles and The Doors, and were highly impressionable in their youth. Johns admitted that "We were always influenced a lot by Black Sabbath and Led Zeppelin it just so happened that we weren't very good at playing that style of music. So we were put in the whole grunge category because it was such a garage-y, heavy music term." Australian rock music journalist Ed Nimmervoll felt that Johns "had never intended to use his problems for inspiration, but in the end the music was the best way to unburden himself. 'Neon Ballroom' took six months to record. The album's passion and musical sophistication proved to the world that silverchair were a force to be reckoned with". According to 100 Best Australian Albums, by three fellow journalists, John O'Donnell, Toby Creswell and Craig Mathieson, Neon Ballroom's lead-in track, "Emotion Sickness", described Johns' life in the 1990s and "addressed [his] desire to move beyond the imitative sounds of Silverchair's first two albums ... and create something new and original". "Ana's Song (Open Fire)" directly focussed on his eating disorder; "[it] became a hit all over the world and opened up for discussion the fact that males could also be affected by anorexia." Allmusic's Stephen Thomas Erlewine felt Diorama "was a shockingly creative and impressive step forward that showed the band shedding its grunge past and adding horns, strings, and mature lyrics to its arsenal." Fellow Allmusic reviewer Bradley Torreano noted that "they somehow kept going and kept improving ... Silverchair has grown up and put together a fine mix of orchestral pop and rock on Diorama." Bernard Zuel described how the Diorama concert tour marked a move from hard rock towards art rock: "they stepped out of the arenas and barns and 'got classy' ... finally having admitted to harbouring artistic ambition (a very un-Australian band thing to do), they've proved they have the ability". In writing Young Modern, Johns tried to make the music sound very simple, despite a complex musical structure. The lyrics were written after the music was created, sometimes as late as the day of recording. As Johns dreads writing lyrics, he suggested that the band could produce an instrumental album at some stage in the future. Johns is the band's primary songwriter, and notes that while Joannou and Gillies do not have significant influence on what he writes, they are key to the band's overall sound. For that album, Hamilton co-wrote four songs with Johns including the APRA Award-winning "Straight Lines". Joannou believed that Young Modern was simpler than Diorama but "still as complex underneath with simple pop song elements". He said that much of the band's success resulted from trying to push themselves harder in recording and writing. Self-producing has allowed the band to do so without the pressures of a record label. Gillies notes that Silverchair will often "run the risk of losing fans" with their work, and this was evident in the changes in musical direction in Diorama and Young Modern. However, he described this as a good thing, describing the fact "that we haven't been pigeonholed, and people really don't know what to expect" as one of the attractive elements of the band. Despite the ups and downs of success at a young age, Gillies says the band "appreciate what we've achieved and what we've got" in their careers. The band have received six APRA Awards with Johns winning three songwriting awards at the 2008 ceremony. Frogstomp was described as similar to Nirvana and Pearl Jam; Erlewine noted that it followed in "the alternative rock tradition" of those bands. Erlewine also stated that "their songwriting abilities aren't as strong" as those of their peers. However, Rolling Stone claimed that the band had risen above their peers, applauding Johns' "ragged vocals". Herald Sun journalist Nue Te Koha praised Frogstomp for "breaking the drought of Australian music making an impact overseas". However, he felt "It is highly debatable whether the three teens have gone to the world with a new sound or something identifiably Australian ... Silverchair's image and sound are blatantly ... Nirvana meets Pearl Jam". Nimmervoll disputed Te Koha's view, "It's not original, it's not Australian. Bah, humbug ... It's just as well Britain didn't say the same thing when The Beatles reinvented American R&B". Freak Show saw the band show more of their own musical style, rather than copying others, and thus received more praise for its songwriting than its predecessor. Yahoo! Music's Sandy Masuo described the lyrics as "moving" and "emotional". Johns' vocal delivery was complemented: his "bittersweet, crackly voice tops the ample power chordage ... [he] hits shivery, emotional notes that convey both sweet idealism and disappointment". Zuel felt that with this album, the band "have outgrown the jokes, predictions and their own understated teenage ambitions to find they have become (gasp!) career musicians." In 100 Best Australian Albums (2010) their third album, Neon Ballroom, was placed at No. 25 according to its authors. Entertainment Weekly approved of the further advancement in Neon Ballroom, commenting on "plush strings on these adult arrangements". There were once again significant advancements in songwriting; Johns was described as "furious, motivated, and all grown up". However, Rolling Stone said the album seemed confused, commenting that Silverchair "can't decide what they want to do" with their music. Meanwhile, Diorama was seen as an extension of the band's originality, with its "[h]eavy orchestration, unpredictable melodic shifts and a whimsical pop sensibility". According to PopMatters' Nikki Tranter, the album stood out in an otherwise dull Australian music market. Allmusic's Clayton Bolger described Young Modern as an improvement by the band, praising "catchy melodic hooks, inspired lyrical themes, and stunning string arrangements". He claimed the album was the pinnacle of the band's development. PopMatters' Nick Pearson saw the opposite, claiming that "[o]nce you reach the level of intellectual maturity where you can tell the difference between cryptic but poetic lyrics and nonsensical crap, you have outgrown Silverchair". Pearson called the album an attempt to secure a safer territory and assure sales, after the success of past works, calling it more boring than its predecessors. Other reviewers noted influences from cult British band XTC. In July 2009 "Tomorrow" was voted number 33 by the Australian public in Triple J's Hottest 100 of all time. As of January 2018, the group have sold 9 million albums worldwide. At the annual ARIA Music Awards, Silverchair holds the record for the most nominated artist, with 49, and the most number of awards won, with 21. Their breakthrough year was in 1995, when they won five out of nine nominations, including 'Best New Talent', and 'Breakthrough Artist' for both album and single categories. Their most successful year was at the 2007 ceremony when they won six of eight nominations. Apter, Jeff (2008). A New Tomorrow: The Silverchair Story. Milsons Point, NSW: Random House Australia. ISBN 978-1-74166-483-6. Erlewine, Stephen Thomas. "Silverchair > Biography". Allmusic (Rovi Corporation). Archived from the original on 12 October 2011. Retrieved 12 October 2011. Mathieson, Craig (1996). Hi Fi Days: The Future of Australian Rock. St Leonards, NSW: Allen & Unwin. ISBN 978-1-86448-232-4. McFarlane, Ian (1999). "Whammo Homepage". Encyclopedia of Australian Rock and Pop. St Leonards, NSW: Allen & Unwin. ISBN 1-86508-072-1. Archived from the original on 5 April 2004. Retrieved 1 October 2011. Note: Archived [on-line] copy has limited functionality. Spencer, Chris; McHenry, Paul; Nowara, Zbig (2007) . "'silverchair' entry". The Who's Who of Australian Rock. Moonlight Publishing. ISBN 978-1-86503-891-9. ^ a b c Carr, Matt (26 May 2011). "Silverchair take "indefinite" Break". The Newcastle Herald. Fairfax Media. Archived from the original on 12 October 2011. Retrieved 12 October 2011. ^ a b Munro, Kelsey (1 April 2006). "Escape Act". Rolling Stone (Australia). ACP Magazines. Archived from the original on 12 October 2011. Retrieved 13 October 2011. ^ a b c d e f g h i j k l m n o p q r s t u McFarlane, 'silverchair' entry. Archived from the original on 19 April 2004. Retrieved 1 October 2011. ^ a b c d e f g h i j k Erlewine, "Silverchair > Biography". ^ a b c d e f g h i Nimmervoll, Ed. "Silverchair". HowlSpace – The Living History of Our Music. White Room Electronic Publishing Pty Ltd. Archived from the original on 13 October 2011. Retrieved 13 October 2011. ^ a b c d "Silverchair". Music Australia. National Library of Australia. 10 April 2003. Archived from the original on 13 October 2011. Retrieved 13 October 2011. ^ "Past performers". YouthRock. Archived from the original on 22 April 2008. Retrieved 3 February 2008. ^ a b c d e f Jenkins, Jeff; Meldrum, Ian (2007). Molly Meldrum presents 50 years of rock in Australia. Melbourne, Vic: Wilkinson Publishing. pp. 86, 231, 261–262. ISBN 978-1-921332-11-1. ^ "Interview with Silverchair". Buzz Magazine. 1 September 1994. Archived from the original on 13 December 2010. Retrieved 1 October 2011. ^ Harmsworth, Andrei (26 May 2011). "Silverchair Announce Split Because 'Being in a Band Is No Fun Anymore'". Metro. Daily Mail. Associated Newspapers. Archived from the original on 12 October 2011. Retrieved 12 October 2011. ^ Sennett, Sean; Groth, Simon, eds. (2010). "Silverchair – No Complaints from the 'Chair". Off the Record: 25 Years of Music. Brisbane, QLD: University of Queensland Press. pp. 223–224. ISBN 978-0-7022-3863-5. ^ "silverchair Speak Out!". Smash Hits. EMAP Limited. January 1995. Archived from the original on 13 February 2003. Retrieved 1 October 2011. ^ a b c d Spencer, et al. ^ a b c d e f g h i Hung, Steffen. "Silverchair Discography". Australian Charts Portal. Hung Medien. Archived from the original on 13 October 2011. Retrieved 13 October 2011. ^ Hung, Steffen. "Silverchair – "Tomorrow"". Australian Charts Portal. Hung Medien. Archived from the original on 13 October 2011. Retrieved 13 October 2011. ^ a b c d "Silverchair: Frogstomp". Rolling Stone. Jann Wenner. 2 February 1998. Archived from the original on 6 July 2007. Retrieved 13 February 2008. ^ a b c d Erlewine, Stephen Thomas. "Frogstomp > Review". Allmusic (Rovi Corporation). Archived from the original on 14 October 2011. Retrieved 14 October 2011. ^ "Kevin Shirley > Credits". Allmusic (Rovi Corporation). Archived from the original on 13 October 2011. Retrieved 13 October 2011. ^ "That's the Breaks, Keanu". Chicago Tribune. Tribune Company (Tony W. Hunter). 24 December 1996. Archived from the original on 13 October 2011. Retrieved 14 October 2011. ^ "Silverchair Perform As "Short Elvis" in Concert at the Gaelic Theatre in Sydney – March 16, 2006". WireImage (Getty Images). 16 March 2006. Archived from the original on 13 October 2011. Retrieved 14 October 2011. ^ Hung, Steffen. "Silverchair – Frogstomp". Australian Charts Portal. Hung Medien. Archived from the original on 14 October 2011. Retrieved 14 October 2011. ^ a b "Gold and Platinum – Silverchair". RIAA. Archived from the original on 16 December 2012. Retrieved 17 February 2008. ^ "Canadian Certifications – Silverchair". Music Canada. 14 October 2011. Archived from the original on 14 October 2011. ^ Danaher, Michael (4 August 2014). "The 50 Best Grunge Songs". www.pastemagazine.com. Paste. Retrieved 8 February 2017. ^ "Artist :: Silverchair". Australian Music Online. Archived from the original on 31 July 2008. Retrieved 12 March 2008. ^ a b "Teen Sentenced to 65 Years for His Part in Murders". Kitsap Sun. E. W. Scripps Company (Charles D Horton III). 22 February 1996. Archived from the original on 14 October 2011. Retrieved 15 October 2011. ^ a b "Attorney wants to open teen's murder trial with rock song". Seattle Post-Intelligencer. Hearst Corporation. 18 January 1996. Archived from the original on 17 May 2011. Retrieved 15 October 2011. ^ a b Elliott, Paul (1997). "Roo Fighters". Kerrang!. Bauer Media Group. Archived from the original on 14 October 2011. Retrieved 15 October 2011. ^ Wooldridge, Simon (February 1997). "Freak Show Review". Juice. ^ "ARIA Charts – Accreditations – 1997 Albums". Australian Recording Industry Association (ARIA). Archived from the original on 14 October 2011. Retrieved 15 October 2011. ^ "silverchair". rage. Australian Broadcasting Corporation (ABC). 4 September 1999. Archived from the original on 14 October 2011. Retrieved 15 October 2011. ^ a b c d Richard, Kingsmill (29 November 2000). "Daniel Johns of silverchair speaks to Richard Kingsmill". Triple J (Australian Broadcasting Corporation (ABC)). Archived from the original on 29 January 2009. Retrieved 4 October 2011. ^ "Silverchair > Charts & Awards > Billboard Albums". Allmusic (Rovi Corporation). Archived from the original on 14 October 2011. Retrieved 15 October 2011. ^ Roberts, David, ed. (2006). British Hit Singles & Albums (19th ed.). HIT Entertainment. ISBN 1-904994-10-5. ^ a b "Silverchair > Charts & Awards > Billboard Singles". Allmusic (Rovi Corporation). Archived from the original on 14 October 2011. Retrieved 15 October 2011. ^ a b c d e O'Donnell, John; Creswell, Toby; Mathieson, Craig (October 2010). "25: Silverchair – Neon Ballroom". 100 Best Australian Albums. Prahran, Vic: Hardie Grant Books. pp. 90–91. ISBN 978-1-74066-955-9. ^ Fisher, Blair R (11 July 1999). "Silverchair Frontman Reveals Battle with Anorexia". Rolling Stone. Jann Wenner. Archived from the original on 30 January 2009. Retrieved 4 October 2011. ^ Sams, Christine (6 June 2004). "Anorexia almost killed me: Daniel Johns". Sydney Morning Herald. Fairfax Media. Archived from the original on 14 October 2011. Retrieved 15 October 2011. ^ a b Chonin, Neva (18 March 1999). "Silverchair: Neon Ballroom". Rolling Stone. Jann Wenner. Archived from the original on 6 July 2007. Retrieved 5 February 2008. ^ Young, Daniel (29 August 1999). "Reading Festival – Reading, UK". Silverchair. Archived from the original on 15 October 2011. Retrieved 15 October 2011. ^ a b c "Band: silverchair – Stories and Highlights". Long Way to the Top. Australian Broadcasting Corporation (ABC). 2001. Archived from the original on 15 October 2011. Retrieved 15 October 2011. ^ Thomas, Les. "Silverchair, The Falls Festival, Lorne, Victoria, 31/12/00". Massive Magazine. Silverchair. Archived from the original on 15 October 2011. Retrieved 15 October 2011. ^ a b "Silverchair Signs with Eleven: Eleven signs with EMI". Silverchair. Archived from the original on 15 October 2011. Retrieved 15 October 2011. ^ Farinella, David John (1 January 2003). "Silverchair's Diorama album – recording the new Silverchair rock CD". Mix. Penton Media. Archived from the original on 15 October 2011. Retrieved 15 October 2011. ^ a b Claire (2009). "Diorama". RollerCoaster. Australian Broadcasting Corporation (ABC). Archived from the original on 15 October 2011. Retrieved 15 October 2011. ^ Neilsen, Mark (22 April 2002). "Another Point of View". Drum Media. ^ a b Tranter, Nikki (6 September 2002). "Silverchair: Diorama". PopMatters. Sarah Zupko. Archived from the original on 23 April 2009. Retrieved 8 February 2008. ^ "Diorama – Silverchair > Credits". Allmusic (Rovi Corporation). Archived from the original on 15 October 2011. Retrieved 15 October 2011. ^ Kemp, Mark (8 August 2002). "Silverchair: Diorama". Rolling Stone (902). Archived from the original on 10 July 2007. Retrieved 6 October 2011. ^ "Great Australian Albums:Diorama – Silverchair". Dymocks. Archived from the original on 15 October 2011. Retrieved 15 October 2011. ^ "Press – Sydney, Australia (Big Day Out)". Chairpage.com (Silverchair). 26 January 2002. Archived from the original on 15 October 2011. Retrieved 15 October 2011. ^ "Dr Kerryn Phelps, Health Editor, with Steve Leibmann, Channel Nine, Today". Australian Medical Association. 6 May 2002. Archived from the original on 12 October 2011. Retrieved 12 October 2011. ^ "Daniel Johns wows fans with buff bod". Nine News. NineMSN (Nine Entertainment Co., Microsoft). 6 August 2007. Archived from the original on 12 October 2011. Retrieved 12 October 2011. ^ Hung, Steffen. "Silverchair – Diorama". Australian Charts Portal. Hung Medien. Archived from the original on 12 October 2011. Retrieved 12 October 2011. ^ a b c d e "Winners by artist: Silverchair". Australian Recording Industry Association (ARIA). Archived from the original on 10 February 2009. Retrieved 1 October 2011. ^ "Silverchair to Bring Diorama Alive at ARIAs". Silverchair. 12 October 2002. Archived from the original on 15 October 2011. Retrieved 16 October 2011. ^ a b MacNeil, Jason (13 July 2007). "Silverchair makes most of break". JAM! Music (CANOE (Quebecor Media)). Archived from the original on 15 October 2011. Retrieved 16 October 2011. ^ a b c "Silverchair". Music Australia. National Library of Australia. 3 April 2007. Archived from the original on 16 October 2011. Retrieved 16 October 2011. ^ "The Dissociatives". Triple J (Australian Broadcasting Corporation (ABC)). 2 April 2004. Archived from the original on 16 October 2011. Retrieved 16 October 2011. ^ "About the Program – Credit List (08/12/2010)". Spicks and Specks. Australian Broadcasting Corporation (ABC). 8 December 2010. Archived from the original on 17 October 2011. Retrieved 17 October 2011. ^ O'Brien, Jon. "Counting Down the Days – Natalie Imbruglia – Review". Allmusic (Rovi Corporation). Archived from the original on 17 October 2011. Retrieved 17 October 2011. ^ "Releases :: Feeling Sideways". Australian Music Online. Archived from the original on 8 June 2008. Retrieved 6 October 2011. ^ "Awards by artist: The Mess Hall". Australian Record Industry Association. Archived from the original on 11 June 2008. Retrieved 9 February 2008. ^ "Notes From A Ceiling". Australian Music Online. 2005. Archived from the original on 9 September 2006. Retrieved 31 May 2006. ^ "ARIA Awards – History: Winners by Year 2005: 19th Annual ARIA Awards". Australian Recording Industry Association (ARIA). Retrieved 6 October 2011. ^ "Tambalane". Australian Music Online. Archived from the original on 21 May 2008. Retrieved 6 October 2011. ^ Yates, Rod (30 October 2007). "Silverchair's Daniel Johns tells of his musical journey". PerthNow. The Sunday Times. News Limited (News Corporation). Archived from the original on 28 October 2008. Retrieved 12 March 2008. ^ Munro, Kelsey (1 December 2006). "Homecoming Heroes". Sydney Morning Herald. Fairfax Media. Archived from the original on 17 October 2011. Retrieved 17 October 2011. ^ a b Erlewine, Stephen Thomas; Leahey, Andrew. "Silverchair". Billboard. Prometheus Global Media. Retrieved 17 October 2011. ^ "Young modern / Silverchair ;". catalogue. National Library of Australia. Archived from the original on 17 October 2011. Retrieved 17 October 2011. ^ "ARIA Awards – History: Winners by Year 2006: 20th Annual ARIA Awards". Australian Recording Industry Association (ARIA). Retrieved 6 October 2011. ^ Sams, Christine (6 November 2006). "Your access-all ARIAs pass". Sydney Morning Herald. Fairfax Media. Archived from the original on 17 October 2011. Retrieved 18 October 2011. ^ "Obama Recruits Kanye West, Arcade Fire Let Loose". Channel V. Archived from the original on 11 June 2008. Retrieved 12 March 2008. ^ "Silverchair Make Chart History". DIG Radio. Australian Broadcasting Corporation (ABC). 12 April 2007. Archived from the original on 17 October 2011. Retrieved 18 October 2011. ^ Rod Yates (30 October 2007). "Silverchair's Daniel Johns tells of his musical journey". PerthNow. news.com.au. Archived from the original on 28 October 2008. Retrieved 27 April 2008. ^ a b Tedeschi, Claire (2007). "Across the Great Divide for Reconcile.org.au" (PDF). Reconciliation Australia. Archived from the original (PDF) on 13 April 2008. Retrieved 18 October 2011. ^ a b Dunn, Emily (13 June 2007). "In concert – rock and reconciliation". Brisbane Times. Fairfax Media. Archived from the original on 17 October 2011. Retrieved 18 October 2011. ^ a b "ARIA Awards – History: Winners by Year 2007: 21st Annual ARIA Awards". Australian Recording Industry Association (ARIA). Archived from the original on 18 November 2007. Retrieved 6 October 2011. ^ a b c Adams, Cameron (17 June 2008). "Silverchair's Straight Lines wins top APRA award". Herald Sun. News Corporation. Archived from the original on 20 June 2008. Retrieved 19 June 2008. ^ "ARIA Awards – History: Winners by Year 2008: 22nd Annual ARIA Awards". Australian Recording Industry Association (ARIA). Retrieved 6 October 2011. ^ Daniel Johns (interviewee), Robbie Buck, Marieke Hardy, Lindsay "The Doctor" McDougall (interviewers) (3 December 2009). Daniel Johns on the New Silverchair Album. Robbie, Marieke and The Doctor. Triple J (Australian Broadcasting Corporation (ABC)). Event occurs at 2:48. Archived from the original on 17 October 2011. Retrieved 18 October 2011. ^ a b Ruckus, Eddie (14 May 2010). "Silverchair's Controversial New Sound". Rock News. Triple M (Triple M Network (Austereo Radio Network)). Archived from the original on 18 October 2011. Retrieved 18 October 2011. ^ "Chairpage News: Silverchair News". Silverchair Official Website. 25 May 2011. Archived from the original on 6 October 2011. Retrieved 7 October 2011. ^ "Silverchair lose their spark, but deny split". 1233 ABC Newcastle (Australian Broadcasting Corporation (ABC)). 26 May 2011. Archived from the original on 18 October 2011. Retrieved 18 October 2011. ^ Lau, Kristie (12 June 2011). "Silverchair drummer works on solo album". Sydney Morning Herald. Fairfax Media. Archived from the original on 18 October 2011. Retrieved 18 October 2011. ^ Halliwell, Elle (1 October 2011). "New Spice to Life for Daniel Johns". The Sunday Telegraph. News Limited (News Corporation). Archived from the original on 18 October 2011. Retrieved 18 October 2011. ^ "Could A Silverchair Reunion Be In The Works?". Take 40. 27 October 2012. Archived from the original on 30 November 2012. Retrieved 4 August 2013. ^ "Silverchair Bass Player Chris Joannou Says That A Reunion Isn't Off The Cards". Take 40. 15 January 2013. Archived from the original on 21 April 2014. Retrieved 4 August 2013. ^ "Silverchair Have Half-Finished Album Says Drummer, Reunion Will Happen". Tone Deaf. 26 October 2012. Retrieved 17 October 2015. ^ a b c Bolger, Clayton. "Young Modern > Review". Allmusic (Rovi Corporation). Archived from the original on 18 October 2011. Retrieved 19 October 2011. ^ "Quick Silverchair Messenger". Rolling Stone. 27 December 1996. Archived from the original on 8 June 2008. Retrieved 18 March 2008. ^ Howitt, Bernie. Focus Study: Grunge. NSW HSC Online (Thesis). Charles Sturt University. Archived from the original on 13 October 2011. Retrieved 13 October 2011. ^ a b c Brownlee, Clint (18 July 2007). "Seattlest Interview: Silverchair Drummer Ben Gillies". Seattlest. Gothamist LLC. Archived from the original on 18 October 2011. Retrieved 19 October 2011. ^ "Episode 6: Gathering of the Tribes 1984–2000". Long Way to the Top. Australian Broadcasting Corporation (ABC). 2001. Archived from the original on 18 October 2011. Retrieved 19 October 2011. ^ Torreano, Bradley. "Diorama – Silverchair". Allmusic (Rovi Corporation). Archived from the original on 18 October 2011. Retrieved 18 October 2011. ^ Zuel, Bernard (12 April 2003). "Silverchair, State Theatre". Sydney Morning Herald. Fairfax Media. Archived from the original on 18 October 2011. Retrieved 19 October 2011. ^ Broadley, Erin (16 August 2007). "Interviews > Daniel Johns of Silverchair". SuicideGirls. Archived from the original on 27 September 2010. Retrieved 19 October 2011. ^ Follos, Tim (24 July 2007). "Young Moderns: Silverchair". Express. The Washington Post Company. Archived from the original on 18 October 2011. Retrieved 19 October 2008. ^ Bolling, Stephanie. "Silverchair: Interview with Chris Joannou". reax. Archived from the original on 10 October 2008. Retrieved 16 February 2008. ^ "APRA Music Awards – 2008 Nominations". Australasian Performing Right Association. Archived from the original on 15 June 2008. Retrieved 19 June 2008. ^ Erlewine, Stephen Thomas. "Freak Show > Overview". Allmusic (Rovi Corporation). Archived from the original on 18 October 2011. Retrieved 19 October 2011. ^ Masuo, Sandy (12 April 1997). "Freak Show". Yahoo! Music. Archived from the original on 4 December 2008. Retrieved 19 October 2011. ^ Ali, Lorraine (27 January 1997). "Freak Show | Album Reviews". Rolling Stone. Jann Wenner. Archived from the original on 19 October 2011. Retrieved 19 October 2011. ^ Zuel, Bernard (3 April 1997). "Men at Work, Boys at Play". Metro. Sydney Morning Herald. Fairfax Media. p. 4. Archived from the original on 19 October 2011. Retrieved 19 October 2011. ^ a b Lanham, Tom (19 March 1999). "Neon Ballroom | Music Review". Entertainment Weekly. Time Warner. Archived from the original on 19 October 2011. Retrieved 19 October 2011. ^ Kemp, Mark (8 August 2002). "Silverchair: Diorama". Rolling Stone. Jann Wenner. Archived from the original on 10 July 2007. Retrieved 13 February 2008. ^ a b Pearson, Nick (22 May 2007). "Silverchair: Young Modern". PopMatters. Sarah Zupko. Archived from the original on 19 October 2011. Retrieved 19 October 2011. ^ Everson, John (2 August 2007). "Foo Fighters, Silverchair, Sound the Alarm". The Star Newspapers (SouthtownStar). Sun-Times Media Group. Archived from the original on 19 October 2011. Retrieved 19 October 2011. ^ "Silverchair – Young Modern CD Album". CD Universe (Muze Inc). 24 July 2007. Archived from the original on 19 October 2011. Retrieved 19 October 2011. ^ "Countdown: Hottest 100 – Of All Time 31–40". Triple J (Australian Broadcasting Corporation (ABC)). July 2009. Archived from the original on 19 October 2011. Retrieved 19 October 2011. ^ "ARIA Awards – History: Winners by Year 1995: 9th Annual ARIA Awards". Australian Recording Industry Association (ARIA). Archived from the original on 26 September 2007. Retrieved 6 October 2011. ^ "Ben Gillies > Credits". Allmusic (Rovi Corporation). Archived from the original on 15 October 2011. Retrieved 16 October 2011. ^ "Chris Joannou > Credits". Allmusic (Rovi Corporation). Archived from the original on 15 October 2011. Retrieved 16 October 2011. ^ "Daniel Johns > Credits". Allmusic (Rovi Corporation). Archived from the original on 15 October 2011. Retrieved 16 October 2011. ^ Cohen, Randy (30 March 1999). "Interview with Silverchair". Rock Publication. Rock Publication Inc. Archived from the original on 25 April 2012. Retrieved 7 October 2011. ^ "Paul Mac > Credits". Allmusic (Rovi Corporation). Archived from the original on 15 October 2011. Retrieved 16 October 2011. ^ "Julian Hamilton > Credits". Allmusic (Rovi Corporation). Archived from the original on 15 October 2011. Retrieved 16 October 2011. This page is based on the Wikipedia article Silverchair; it is used under the Creative Commons Attribution-ShareAlike 3.0 Unported License (CC-BY-SA). You may redistribute it, verbatim or modified, providing that you comply with the terms of the CC-BY-SA.